It feels a little odd when women I don’t recognize walk up to me and ask, “Are you Grace Fox?” But when it happened at my hotel’s hot tub on Saturday night, it was over-the-moon extraordinary. Gene and I had spent the day hosting our ministry booth at Missions Fest Winnipeg. Our feet and backs ached from standing so long, so we slipped into the hotel’s hot tub to soak our wearies away. The woman broke into a big smile. “My name is Carolyn, she said. “This is amazing. I was on a women’s ministry committee that brought you to Winnipeg many years ago, and I attended the conference at which you spoke here last October. I receive your newsletter and blogs, and I follow you on Facebook. I consider you my mentor!” Then this dear woman proceeded to tell me about the events leading to that moment. Carolyn had awakened that morning to a harsh reality: a water main had burst beside her family home. Water several inches deep flooded her entire block, and her house suffered the most damage. Several feet of water filled her basement before city workers arrived to turn off the main. A sense of God’s sweet presence and sovereignty fell on us. We both recognized that He had orchestrated our meeting as a tangible evidence of His presence in her situation. I mean, just think about it: My husband made reservations at this hotel weeks ago; her family booked their room—at the same facility—that day. We’d decided to soak for about twenty minutes and were about to leave when she showed up. If she’d come a minute later, we would have missed each other. Equally, we would have missed each other if either of us had decided against using the hot tub. In light of what I wrote about God’s goodness on Friday, our human tendency might be to think it could have prevented the water main from breaking and Carolyn’s home from sustaining so much damage. Why would God’s goodness displace her family in the dead of winter? And as for her entire neighborhood, well, no one has water at this time. Everything’s shut off until repairs can be made. Meanwhile, the flooded road, driveways, and yards are slick like skating rinks. What’s with that? We don’t see the big picture God’s painting, but we have to trust that He’s doing something that’s ultimately going to be good. 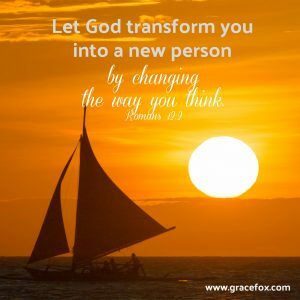 Sometimes that “good” isn’t seen in the circumstances themselves but in the transformation that takes place in us as they refine us, making us more like Jesus. “God is good all the time,” said Carolyn. “Even though all this stuff happened, the truth is still the same—He is good.” I agreed. 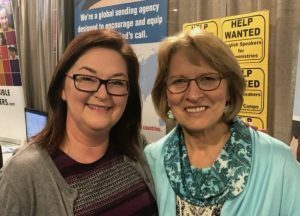 We hugged and marveled together that, In the midst of this hardship filled with uncertainty for Carolyn and her family, God crossed our paths at a hot tub in a Winnipeg hotel so we could experience His goodness firsthand. Who would have thought? 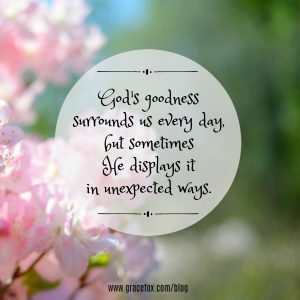 How have you experienced an evidence of God’s goodness recently? God’s sense of humor makes me smile, especially when the joke’s on me. 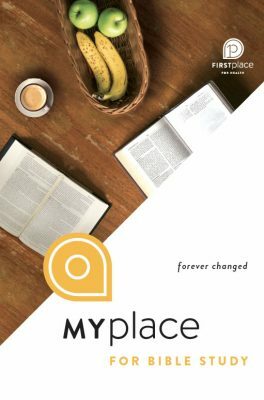 I wrote the Bible study Forever Changed exactly a year ago, and now the weekly online Bible study group of which I’m a member has chosen to use it. So, here I am, a student of my own study—learning from the things I wrote last year at this time. Today’s lesson speaks of God’s goodness. Yes, blessings such as these are evidences of God’s goodness in our lives. But what about those things that are blessings in disguise? You know, the circumstances that, humanly speaking, aren’t those we’d choose? I can recall a few…. When my husband contracted a blood infection as a result of having a biopsy. When my new grandson spent a week in the NICU after his birth in December. When our boat furnace quit working and the recommended repair guy broke his promises to come and fix it every day for nearly two weeks (the saga continues—“God is good”). 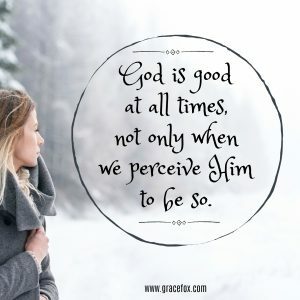 It’s not our natural tendency to declare “God is good” when we get stuck in traffic or our internet connection feels sluggish or an unexpected phone call interrupts our plans. How much less is it our tendency when the big stuff happens. Those unexpected and often unwelcome blessings in disguise come along, and we lose perspective. We focus on our circumstances and lose sight of the good God who orchestrates them for reasons beyond our understanding. Would you agree with me that our understanding of God’s character might be flawed? I suspect that, if we truly understood who He is, we would more readily declare “God is good” even in the midst of tough stuff. You see, our circumstances don’t determine whether or not He’s good. He IS good because that’s His nature not because we perceive Him to be so. If we truly understood God’s goodness, then we’d recognize it in the very fact that we woke up this morning. That we had food in the fridge and in our cupboards. That clean water poured from the tap the moment we turned it on. That, even if woke up to circumstances difficult and beyond our control, we still have a wise and loving God who’s sovereign over them and who promises to turn ashes to beauty and who offers to carry our concerns if only we’ll let Him do so. God is good not only when life is good. He’s good all the time. Even when life stinks. Even when the furnace dies in winter. Gotta love it when He reminds me of the truth using something He directed me to write a year ago. Read Exodus 33:19 and Exodus 34:5-7. What do you discover about God’s character in these verses? Some of you have followed my saga on my FB timeline. Our boat’s furnace died nine days ago, and we’ve been living without heat (apart from two little space heaters) since. If we were in the South Pacific, that wouldn’t matter! But living in Vancouver’s damp winter cold is another story. And then there’s the feeling of being held hostage by circumstances beyond our control. The furnace repair guy, bless his heart, is run off his feet with work. Several times we’ve rearranged our schedules to be here at the time he said, but then he’s canceled or texted to say he’ll be later than expected…and then texted again to say he’ll be later than expected. We wait and postpone and reschedule and cancel because we need to be here when he shows, but all for naught. You get the picture. Yesterday afternoon Mr. Fix-it installed the repaired furnace. It ran well for a few minutes. He packed up his tools and went home, and then it died. My hubby worked on it until bedtime and started again at 6:00 AM today, trying everything he knows to do but without success. He texted Mr. Fix-it a couple hours ago; he just replied saying he’ll come by tonight. Time will tell. Meanwhile, Gene’s efforts have pushed him further and further behind in the office. I rose early this morning and carried our dirty laundry to the marina laundromat before the sun came up. As I walked, I felt my thoughts slipping into a negative mindset. Poor me. Here I am, a 60-year-old woman living on a boat—in winter—with no heat. Carrying her laundry in the cold. In the dark. Blah, blah, blah. One word came to mind: Toxic. I passed a marina resident hobbling across the parking lot on crutches. Whatever his condition is, it appears permanent. I’ve never seen him walk without these aids. The sight sparked gratitude for my two healthy legs. Self-pity began losing its grip. I’d have thirty minutes before needing to transfer our clothes to the dryers, so I headed back to the boat. Frost covered the dock, making it a slippery danger. The marina stocks a big box with salt for days like this. The last time I looked inside, it was empty. This morning, it was full. “Thank You, Jesus, for salt to melt the frost.” I filled a bucket and sprinkled it along the entire dock, praying for my neighbors as I passed their boats. When I checked my emails, I read about a Pakistani believer named Asia Bibi. She’d already endured imprisonment for nine years. Recently released and acquitted, she now faced a judicial review of the same charges that sent her to prison in the first place. If found guilty, she faced hanging. I paused. I prayed for my persecuted sister. And I pondered. Suddenly living without heat for nine days didn’t seem so bad. This inconvenience shall pass sooner or later. Meanwhile, I have a warm blanket to spread across my legs. I have food in the fridge and propane on which to cook it. I have clothes to wear and wash. And I have a husband who works tirelessly without complaint. I also have a Savior who cares enough to warn me when I’m heading into Toxic Territory. How long will this saga continue? I really have no clue. 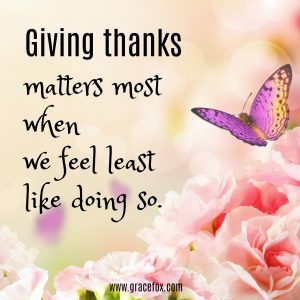 But this one thing I do know—I choose, by God’s strength, to give thanks in the midst of it. For what are you thankful today, my friend? Oh, how Satan enjoys hurling statements like these at us. He crafts his words to condemn us, and sadly, he often accomplishes his mission. 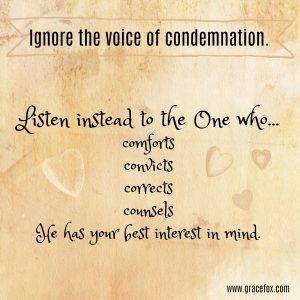 When we lend him our ear, we fall into shame and self-blame. We fixate on our failures. We berate ourselves, doubt our worth, and question our purpose. Everything Satan whispers or shouts is a lie because he’s a liar by nature. We needn’t give him one ounce of attention. Rather, let’s fill our minds with the truth and, in doing so, deflect his deadly lies meant to wound us. The next time Satan tries to hurl condemnation your way, remind him that there is no condemnation for those who know Jesus as Savior. Recall the truth, and tell him to get lost. He has no right invading your space, robbing your peace, or stealing your joy. What words does Satan use to try to condemn you? This quote has become a personal favorite. It constantly reminds me that our thoughts matter. They ultimately shape who we become and determine our destiny so we’d better make sure they’re aligned with Truth. Doing so is the key to lasting change. Today marks the sixth anniversary of the beginning of my wellness journey. I’ll never forget the searing pain when my left Achilles tendon ruptured moments after I stepped out of my car to attend a meeting. Kaboom! My husband rushed me to the ER where I waited for nearly five hours, trying to hold my foot in one position while holding back my tears. Lack of movement and stretching stiffened my muscles and tendons and contributed to weight gain. I excused my sedentary lifestyle with, “Exercise hurts too much.” Gluttony and snacking on chips and chocolate (in secret, nonetheless) added to my problems. A week after the Achilles injury, my opposite knee developed issues of its own. 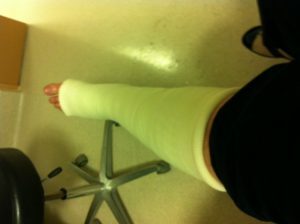 That led to physiotherapy twice a week (big owie), surgery, and loss of mobility. Three months passed before I was able to walk again, and then shingles struck. I was a physical wreck, to put it lightly. I am beyond grateful to First Place for Health for helping me identify wrong thinking and turn me around. Now I acknowledge gluttony as sin, and I readily admit my need for God’s help to guard me from it. I also acknowledge my need for accountability. I can’t possibly travel this lifelong wellness journey on my own. I need others to help me, to encourage me, and to pick me up when I fall. I recognize my body as God’s temple. He’s entrusted me with its stewardship. No one else can care for it—that’s my job. Do I want to provide Him with a dwelling fit for a King, or offer Him a rundown shack? The change in thinking has changed my life for good. My weight has dropped. My blood pressure and heart rate are excellent, and I feel better than I’ve felt in twenty years. It’s also impacted me in other areas of my life—mental, emotional, and spiritual. So today is a celebration of sorts for me. I now hold in my hand the newly released Bible study Forever Changed. Based on Romans 12:2, it identifies areas in which we often fall prey to faulty thinking and then explores the corresponding truth of God’s Word. Changing my thoughts has changed my life, and I pray that countless others will find the same outcome in every part of who they are. Watch the webinar “Forever Changed” here. Order your copy of Forever Changed. Several questions sit at the forefront of my mind during this first week of 2019. The one weighing on me most is this, “How should I best develop my teaching materials for my trip to the Middle East in March?” I have to prepare ten sessions to help train young adults for career missions, and I need the materials to be biblically sound, culturally relevant, and interactive. Every time the inner angst rears its head, I recall these promises and hold them tight. My heart responds with a sigh of relief, and I feel able to move forward again. How do I mend this broken relationship? Should I look for a different job? Should we sell our house and move to a different neighborhood? Is this the right time to start our family? Should I continue in this relationship, or should I break it off? How can I build relationships with my neighbors? How can I rebuild my life after my recent loss? No doubt this list could be endless. 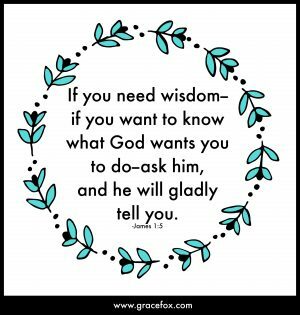 Whatever questions we ask, we can rest assured that God hasn’t left us to answer them on our own. He’s promised to guide, advise, and lead us. All we need to do is ask Him, and He will answer. He will. I know, I know…Christmas proper has come and gone. Still, it’s nice to linger a little longer. Why rush the season away, right? I recently read the lyrics from a carol titled, “In the Bleak Midwinter” by Christina Rossetti. Imagine a young mom cradling her newborn and kissing him tenderly on his cheek, on his forehead, and on the tip of his teeny nose. But this is no ordinary baby. Neither are these run-of-the-mill mommy kisses. They’re sweet, private expressions of gratitude to almighty God incarnate, the infant she’d wrapped in swaddling clothes and nursed to sleep. Mary worshiped Jesus for leaving heaven’s glory to dwell among mankind. She worshiped Him as the promised Messiah. She worshiped Him for coming to bring hope to hurting men and women. She did it without fanfare or before a public eye. She did it quietly, perhaps alone, and with a simple but meaningful act of affection. We, too, can worship the Beloved with a kiss, figuratively speaking. In those quiet, private moments when no one’s watching, we can whisper words of praise and adoration to the One whose faithfulness is new every morning. We can breathe words of prayer to thank Him for keeping His promises. We can lavish our love on Him by expressing gratitude for all He’s done and will do in us and through us as He reveals more of Himself to us. What does worshiping Jesus with a kiss mean to you? Hi everyone. This isn’t my usual devotional blog, but I thought you might enjoy hearing Pure Flix’s thoughts on recommended Christmas movies. Pure Flix is currently offering an email promotion that allows participants to receive a month’s subscribership as well as exclusive access to Christmas movies. Check it out! As the town’s winter dance quickly approaches, a young woman learns that she must miss it to attend a Christmas Eve service with her family. Out of spite and desperation to attend the dance of the season, she wishes faith didn’t serve such an important role in her family’s life. This movie reminds viewers of the importance of faith, its ability to unite families, and to be careful what we wish for. Even during hardships, God has blessings up His sleeve. In the wake of his beloved wife’s death, a man grapples with loss and faith. As his hope and trust in God grows thin, his estranged children come back into his life and provide it with new meaning. A father and son weather a brutal blizzard in order to bring Christmas to a family in need. This story of courage and love reminds viewers that God’s greatest blessings often occur through the people with whom we cross paths. The “perfect” couple find themselves in a financial predicament just in time for the holidays. In desperation, they devise a plan to rob a wealthy man whose riches come from more than what he owns—his faith. When he catches them in the act, he offers them a choice: find God or face the consequences of their greed. A successful, uptight sportscaster who lives life in overdrive allows his anger to get the best of him at his son’s basketball game. He’s sentenced to community service at the local Salvation Army where he’s faced with an important lesson in giving. Sometimes the true meaning of the season sneaks up on us in unexpected ways! Carve out some time in your hectic schedule to relax. Cuddle up with your loved ones and a few warm blankets. Enjoy a cup of hot cocoa and a bowl of popcorn as you indulge in these exclusive holiday flicks. “Of course,” Gene and I said. We threw a few clothes into a gym bag and rushed to catch the next ferry to Vancouver Island. Babysitting the kids—seven of them—brought sheer delight. And exhaustion. I cooked for a small army, wiped little bottoms, changed diapers, settled minor squabbles, played board games, washed and folded clothes, cooked for a small army (did I already say that? ), got kids dressed for their Sunday school Christmas pageant, and even took a hike through the forest with my two oldest grandsons. 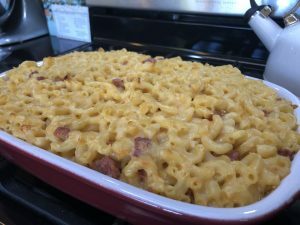 Lots and lots of mac and cheese! I chose to be present in the moment and basically checked out of social media. Besides, by day’s end I was too tired to do anything but crash on the couch for a few minutes before falling into bed. “Jesus—strength,” became my prayer. He answered by giving me a good night’s sleep and the energy to keep doing what needed to be done. “Jesus—healing,” I prayed. I wish I could say Gene’s tooth instantly felt better. It didn’t. But he did manage to see a dentist and get a prescription for antibiotics. This week, on Tuesday, he’ll have a root canal. “Jesus—healing,” I’m praying again. I’ve committed four days this week to helping our youngest daughter and her husband pack their household as they prepare to move north. David is in medical school and has been assigned to the University of British Columbia’s Prince George campus for his studies. Kim is expecting their first child in May. I’ll be honest—I’m not excited about packing them up and sending them so far away. My heart feels heavy, but my hands are open. I bless them for following God’s path even though it means we won’t see them as often as in the past five years. “Jesus—peace,” will be my prayer as I wrap dishes and pack books and belongings. This one’s a big ask, but I’m trusting Him to answer. As Christmas approaches, we celebrate Jesus as the Savior who came as a helpless baby. 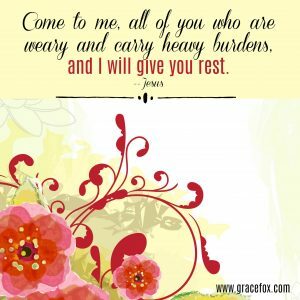 But let’s also celebrate Him as the One who gives us rest when we’re tired and carries our burdens when we’re overwhelmed. Almighty God, the Great Physician, the Prince of Peace has come. Exhale stress. Inhale His soothing presence. What Difference Does “Immanuel—God is With Us” Make? Can you believe we’re already in December? It feels like this year’s raced past at breakneck speed. Christmas is only a blink away! Our family keeps Christmas pretty simple, and I’m grateful. Doing so gives me the mental space to focus on Jesus as the real reason for celebrating this season. One of my favorite things to do is to meditate on His names. Take “Immanuel” for instance. “The virgin will conceive a child! 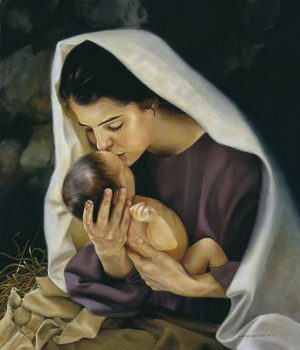 She will give birth to a son and will call him ‘Immanuel’—‘God is with us,’” says Isaiah 7:14. “God is with us.” What an amazing declaration! These four words have the power to change everything for us when we live from their truth. His presence brings comfort when we face the empty chair at the table this season. His presence brings companionship when we feel lonely at night. His presence brings strength when we feel exhausted. His presence brings victory when we face temptation. His presence brings calm when circumstances seem out-of-control. His presence brings hope when we can’t see the light at the end of the tunnel. His presence brings stability when we undergo change. Living from the truth of these words means also believing them on behalf of those we love. I’m constantly having to put this into practice. Last week I helped my 86-year-old mom in Alberta purge her belongings. Now I’m back home, and nearly a thousand miles separate us. I worry less about her when I remember that God is with her and will care for her needs. While I was in Alberta, I received news that my daughter-in-law spent a day in hospital in early labor. I wished I could have been present to babysit the grands, but that was impossible. I found peace in knowing God was with her and their family. Also while I was in Alberta, my eldest daughter in Washington tripped while running. She required several stitches to close a gash on her face, and she injured her wrist. Again, I wished I could have been present to lend a hand in practical ways, but that wasn’t meant to be. I found peace in knowing God was with her and her hubby as they worked through this challenge. “God is with us.” I can’t imagine four other words that bring hope such as these do. 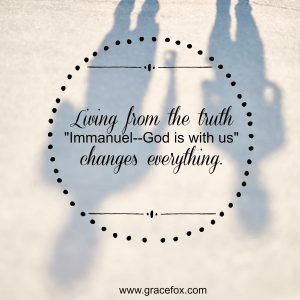 How does “Immanuel—God is with us” change the way you view a current situation?